The Trax has been the mainstay of the F-One twin tip line up for some years; 2016 saw the introduction of the Lite Tech construction and this year it makes a return. The board is built with a 3D Paulownia wood core for optimized stiffness and weight reduction. Bi-axal glass fiber is then used to lock in the torsional twist and flex of the board. There is a carbon version the Trax which is a little stiffer, the glass version we have here offers a slightly softer ride through the chop. Aimed at the avid freerider and people looking to pull freestyle tricks too, the Trax is billed as being a versatile twin tip. The big difference between this and other boards out there is the Helical Rail Design or HRD for short. A unique construction process is used allowing the rails of the board to be shaped. The rail is different at various sections of the board. The idea being that you need a sharp rail to go upwind, bit also a soft section to help with carving. The Lite Tech element of the build allows light to pass through the board, making for amazing photos and stunning looks. 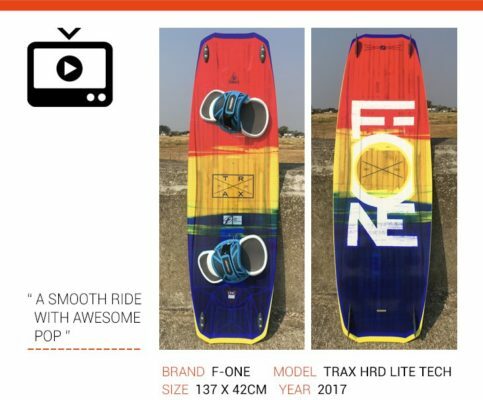 We’ve been huge fans of the Trax for many years, it’s a fantastic freeride board and is very capable of pulling the latest freestyle moves too. It’s been a while since we had ridden one so when it arrived at the office there was a small fight over who gets the first go. On the water the ride through chop is sublime, the HRD rail tech works well to smooth out the bimps and reduce spray. Combined with the softer flex of the glass version you are rewarded with incredible pop and release off the water. The wide outline of the 137 and the deep channels in the bottom of the board then help to smooth the landings. We found the Trax HRD to be a very easy and forgiving board to ride. However, it still packed in a ton of performance when you wanted it to. If you want one of the best-looking boards around that is packed with technology and clever features the Trax HRD fits the bill perfectly. The new Platinum3 bindings are brilliant and offer a wide range of sizing. A smooth ride with awesome pop is the best way to describe the Trax HRD Lite Tech. Lear more about the 2017 TRAX HRD Lite Tech twin tip!